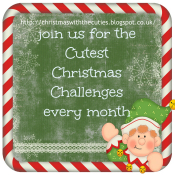 one happy little crafter: Christmas with the Cuties are back!!! Hello there my lovely blog chums, hope you had a great weekend. Before I go any further, I must say a huge thank you for your lovely comments on my last post. Why not get a really early jump on your Christmas cards this year, and hop on over and join us! Fabulous card Lisa, super cute. So adorable Lisa..very cute card. Awww this is so cute Lisa, I love that adorable polar bear! Thanks so much for joining us at the Holly & Ivy Christmas Challenge! Great card Lisa, love the cute bear.